Wine tours to Southwest of France are rare… and a study trip like we are offering this fall is simply unique and won’t be repeated any time soon! Don’t miss this unique opportunity to travel through all the key appellations of this authentic wine region of France with a true expert and fabulous instructor! Indulge in the renowned, rustic and authentic cuisine of the Perigord… porcinis, truffle, duck confits, foie gras, goat cheeses, cassoulet, and locally-caught fish. Become one of the few to understand and master the wines of this authentic corner of France! Participants arrive independently in the city of Bordeaux. Meet Andrew Jefford and the group at 4:30pm at Hotel de Normandie for transfer to Monestier in the stunning Dordogne River valley. 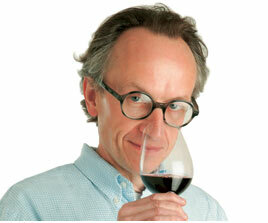 Along the way, Andrew will talk about the Southwest region and its wines. Arrive early evening at the splendid Relais des Vigiers, on the beautiful grounds of 18th century Chateau des Vigiers. Begin your explorations of the vineyards of the Dordogne River valley and the Périgord in Monbazillac, known for its fine dessert wines. You’ll visit this appellation’s leading estate, Chateau Tirecul la Gravière. Visit Chateau de Tiregand in AOP Pecharmant, where you’ll see the 17th century chateau and gardens and enjoy a tasting of their great Pecharmant and Bergerac wines. Stop for a delicious lunch at the charming Restaurant La Flambée near Bergerac. Move on to Cahors and check into the lovely Hôtel de la Truite Dorée on the banks of the Lot River. Dinner will include sumptuous Southwest dishes at the hotel’s highly-rated restaurant. This morning, explore the terroir and wines of Cahors, one of the great emblematic appellations of the Southwest. As guests of the Winemakers’ Union of Cahors, begin with a tour of the vineyards, followed by a trade tasting with the top vignerons of the appellation. Join the Cahors winemakers for lunch at a fine local restaurant. Move on to AOP Gaillac, where wine production goes back more than 2000 years! Visit top estate Domaine d’Escausses, and taste their white, red and sparkling Gaillac wines. Return to your hotel for a free evening and dinner on your own. Check out, then travel south to the vineyards of Fronton. You’ll be welcomed at Chateau de Plaisance, a family estate where you’ll taste reds made from the local Negrette variety, as well as their dry and sweet Fronton whites. Just 60 kilometers north of the majestic Pyrenee Mountains, arrive in the vineyards of Madiran and Pacherenc de Vic Bilh. Visit top producer Chateau Montus, where you’ll taste great Tannat-based reds, as well as fine dry and sweet Pacherenc whites. Arrive at your hotel in Pau, gateway to the Pyrenees. Take the evening to explore this lovely, historic city and dine in one of its fine restaurants. Travel into the Pyrenees to the picturesque Basque Country and AOP Irouleguy. Visit La Cave Irouleguy, a small, high-quality cooperative producing some of this tiny appellation’s best wines. In Saint Jean Pied de Port, enjoy a gastronomic lunch at Michelin 1-star restaurant Les Pyrenées. This afternoon, explore AOP Jurançon with a visit to Domaine Cauhapé, where you’ll taste top-rated Jurançon sec and moelleux wines. Return to Pau late afternoon, and freshen up for a gastronomic farewell dinner at the elegant Jeu de Paume restaurant. Back in Jurançon today for another great winery visit, this time at Domaines Latrille where you’ll taste wines from their two highly-rated estates, Chateau Jolys and Chateau de Jurque. Stop for a delicious lunch at restaurant Le Saint Vincent. Learn about Armagnac production techniques at one of its top producers, Armagnacs Françis Darroze, and enjoy a tasting of their best Armagnacs. Transfer late afternoon to Bordeaux Gare St. Jean train station and Bordeaux Mérignac Airport. 5 gourmet lunches with fine wines, including one at a Michelin 1-star restaurant. Why study Southwest wines..in Southwest France? Southwest France is a lush, hilly wine region that occupies the corner bordered by the Atlantic Ocean on the west, and Spain and the Pyrenees Mountains on the south. Viticulture was established here before Bordeaux was planted to the vine. Some of the world’s great grape varieties originated here and many of the area’s lesser-known varieties are grown nowhere else. Over 300 different grape varieties have been identified in Southwest France, 120 of these are indigenous. Cabernet Franc, which originated in the Pyrenees, successfully crossed with Magdeleine Noire in Southwest France to produce Merlot, an international superstar. Native Malbec was taken from Quercy/Cahors to Bordeaux between 1737-1747 to become an important part of that region’s red blend until the winter freeze of 1956 decimated the vineyards. The Bordelais replanted with Merlot; Malbec crossed the Atlantic to become the mainstay of Mendoza in Argentina. 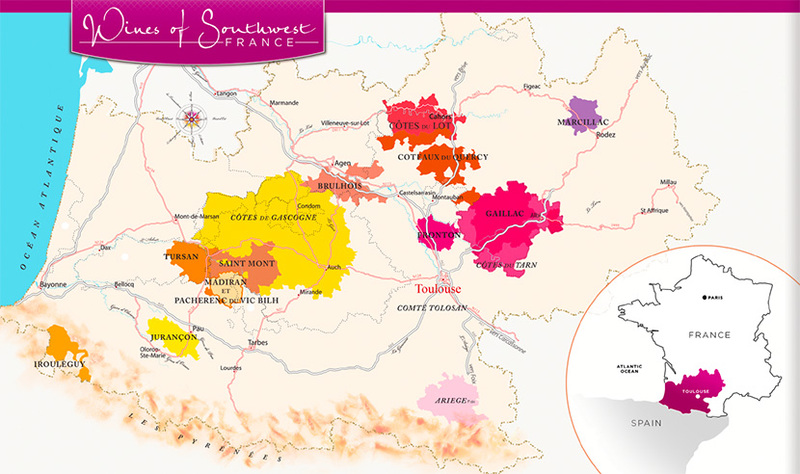 The region is home to a string of more than two dozen winemaking appellations including Fronton, the home of the red grape Négrette, a native variety not grown anywhere else in the world and Jurançon, a celebrated sweet wine made from Petit Manseng and Gros Manseng. The region is also one of the most important brandy producer in France and one of the finest brandy in the world: Armagnac. Winemaking techniques developed in the Southwest are now employed worldwide. Micro-oxygenation, a winemaking technique developed to soften aggressive tannins, was developed by Patrick Du Cournau while working with the native Southwest grape, Tannat, in Madiran. The Southwest is also the home of such famous literary characters as “The Three Muskateers” and “Cyrano de Bergerac.” It’s culinary claim to fame is duck, goose and foie gras.